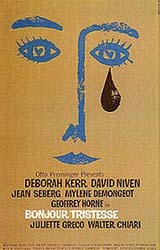 Saul Bass was not only one of the great graphic designers of the mid-20th century but the undisputed master of film title design thanks to his collaborations with Alfred Hitchcock, Otto Preminger and Martin Scorsese. Bass was one of the first to seize on the potential storytelling power of the opening and closing credits of a film. He used a number of styles (animation, live action, type treatments) to create credits for a diverse range of films. What he created were opening credit sequences that did not simply announce the credits and open the film but were a logical extension of the film. Each sequence was, in itself, a short film that prepared the viewer for what was to come. He was a celebrated graphic designer before he ventured into the film world. Born in the Bronx district of New York in 1920 to an emigré family, Bass studied at the Art Students League in New York and Brooklyn College under Gyorgy Kepes, a Hungarian graphic designer who had worked in 1930s Berlin before coming to the USA. Kepes introduced Bass to Moholy’s Bauhaus style and to Russian Constructivism. After apprenticeships with Manhattan design firms, Bass worked as a freelance graphic designer or ‘commercial artist’ as they were then called. Chafing at the creative constraints imposed on him in New York, he moved to Los Angeles in 1946. After freelancing, he opened his own studio in 1950 working mostly in advertising until Preminger invited him to design the poster for his 1954 film, ‘Carmen Jones’. Impressed by the result, Preminger asked Bass to also create the film’s title sequence. 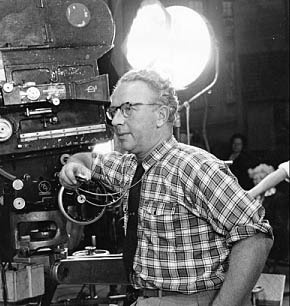 After ‘Carmen Jones’ he got commissions for two 1955 films: Robert Aldrich’s ‘The Big Knife’ and Billy Wilder’s ‘The Seven Year Itch’ but it was his second project for Preminger, ‘The Man with the Golden Arm’ which established Bass as the doyen of film title design. 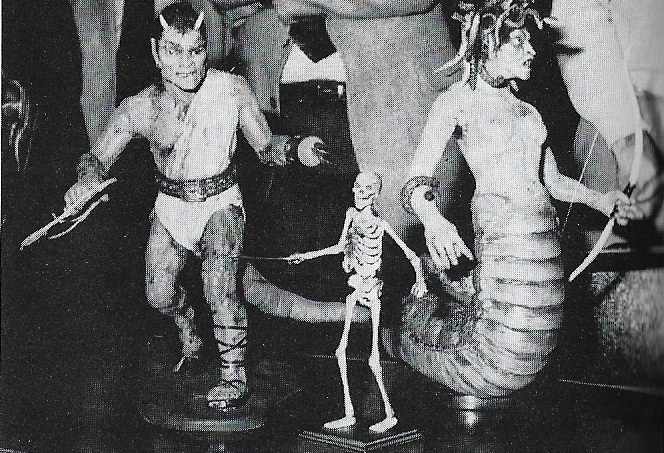 When the reels of film for Otto Preminger’s controversial new drugs film, ‘The Man with the Golden Arm’ arrived at US film theatres in 1955, a note was stuck on the cans ….. ‘Projectionists, pull curtain before titles’…… until then, the lists of cast and crew members which passed for film titles were so dull that projectionists only pulled back the curtains to reveal the screen once they’d finished but Preminger wanted his audience to see this film’s titles as an integral part of the programme. The film’s theme was the struggle of its hero – a jazz musician played by Frank Sinatra – to overcome his heroin addiction. The titles featured an animated black paper cut-out of a heroin addict’s arm. 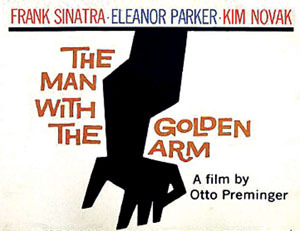 Knowing that the arm was a powerful image of addiction Bass had chosen it – rather than Frank Sinatra’s famous face – as the symbol of both the film’s title and its promotional poster. That cut-out arm caused a sensation and Saul Bass reinvented the film title as an art form. By the end of his life, he had created over 50 title sequences for Preminger, Hitchcock, Kubrick, Frankenheimer and Scorsese. Although he later claimed that he found the ‘Man with the Golden Arm’ sequence …. 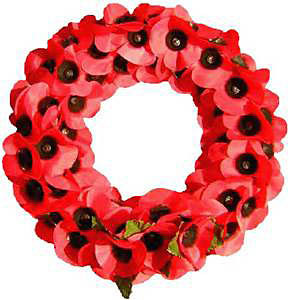 ‘a little disappointing now, because it was so imitated’…. Over the next decade he honed his skill by creating an animated mini-film for Mike Todd’s 1956 ‘Around The World In 80 Days’ and a tearful eye for Preminger’s 1958 ‘Bonjour Tristesse’. Blessed with the gift of identifying the one image which symbolised the essence of a film, Bass then recreated it in a strikingly modern style. Martin Scorsese once described his approach as creating ….‘an emblematic image, instantly recognisable and immediately tied to the film’……. In 1958’s ‘Vertigo’, his first title sequence for Alfred Hitchcock, Bass shot an extreme close-up of a woman’s face and then her eye before spinning it into a sinister spiral as a bloody red soaks the screen. For his next Hitchcock commission, 1959’s ‘North by Northwest’, the credits swoop up and down a grid of vertical and diagonal lines like passengers stepping off elevators. 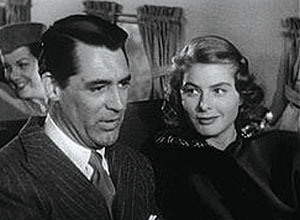 It is only a few minutes after the film has begun – with Cary Grant stepping out of an elevator – that we realise the grid is actually the façade of a skyscraper. Equally haunting are the vertical bars sweeping across the screen in a manic, mirrored helter-skelter motif at the beginning of Hitchcock’s 1960 film ‘Psycho’. This staccato sequence is an inspired symbol of Norman Bates’ fractured mental state. Hitchcock also allowed Bass to work on the film itself, notably on its dramatic highpoint, the famous shower scene with Janet Leigh. Assisted by his second wife, Elaine, Bass created brilliant titles for other directors – from the animated alley cat in 1961 ‘Walk on the Wild Side’, to the adrenalin-laced motor racing sequence in the 1966 film ‘Grand Prix’. 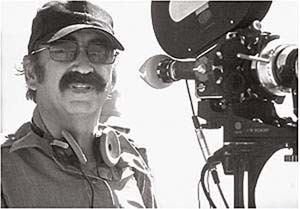 He then directed a series of shorts culminating in 1968 Oscar-winning ‘Why Man Creates’ and finally realised his ambition to direct a feature in 1974 with ‘Phase IV’. When the film unfortunately flopped, Bass returned to commercial graphic design. 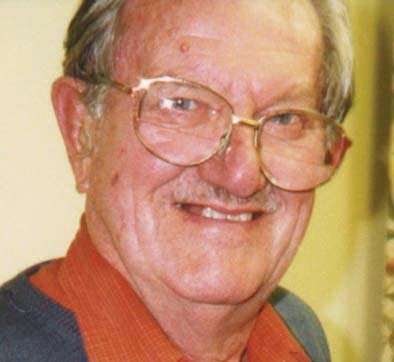 His corporate work included devising highly successful corporate identities for United Airlines, AT&T, Minolta, Bell Telephone Systems and Warner Communications. He also designed the poster for the 1984 Los Angeles Olympic Games. To younger film directors, Saul Bass was a cinema legend with whom they longed to work. In 1987, he was persuaded to create the titles for James Brooks’ ‘Broadcast News’ and then for Penny Marshall’s ‘Big’ in 1988. In 1990, Bass found a new long term collaborator in Martin Scorsese who had grown up with his 1950’s and 1960’s titles. After ‘Goodfellas’ in 1990 and ‘Cape Fear’ in 1991, Bass created a sequence of blossoming rose petals for ‘The Age of Innocence’ in 1993 and a hauntingly macabre one of Robert De Niro falling through the sinister neon lighting of the Las Vegas Strip for the director’s 1995 film ‘Casino’ to symbolise his character’s descent into hell. Saul Bass died the next year. His New York Times obituary hailed him as …‘the minimalist auteur who put a jagged arm in motion in 1955 and created an entire film genre … elevating it into an art’…. Saul Bass’s film credits include: Casino – 1995, Mr Saturday Night – 1992, Cape Fear – 1991, Goodfellas – 1990, War of the Rose – 1989, Big – 1988, Broadcast News – 1987, The Human Factor – 1979, Rosebud – 1975, Grand Prix – 1966, Bunny Lake is Missing – 1965, The Victors – 1963, It’s a Mad Mad Mad Mad World – 1963, Walk on the Wild Side – 1962, West Side Story – 1961, Exodus – 1960, Spartacus – 1960, Ocean’s Eleven – 1960, North by Northwest – 1959, The Big Country – 1958, Bonjour Tristesse – 1958, Around the World in Eighty Days – 1956, The Man with the Golden Arm – 1955, The Seven Year Itch – 1955, Carmen Jones – 1954. The filming of each picture is a problem in itself. The solution to such a problem is an individual thing, not the application of a mass solution to all problems. Film production methods of yesterday may seem out of date today and yet, tomorrow’s problem may be best solved by using yesterday’s methods. The first rule of direction must be flexibility. Nothing should be permitted to interfere with the story. The making of a picture is nothing but the telling of a story and the story – it goes without saying – must be a good one. I do not try to put on to the screen what is called ‘a slice of life’ because people can get all the slices of life they want out of the cinema. On the other hand, total fantasy is not wanted because people desire to connect themselves with what they see on the screen. Those are all the restrictions I would place on the story. It must be believable and yet not ordinary. It must be dramatic and yet lifelike. Having decided upon our story, we must next develop our characters and the plot. When that is done, are we ready to go on to the floor? I maintain we are not because our picture is going to need editing and cutting – and the time for this work is before shooting. The cuts should be made in the script itself, before a camera turns and not in the film after the cameras have stopped turning. My objection to the more conventional method of cutting is twofold. First of all, it is wasteful. The tragedy of the actor whose entire part ends on the cutting-room floor is not entirely a personal one. His salary, the sets he acted in and the film on which his acting was recorded all represent expenditure. More important, if each scene is filmed as a separate entity out of sequence, the director is forced to concentrate on each scene as a scene. There is the a danger that one such scene may be given too great a prominence in direction and acting and its relation to the remaining scenes in the picture will be out of balance, or again, that it may have been given insufficient value and, when the scene becomes part of the whole, the film will be lacking in something. The ‘extra shots’ made after the regular schedule is completed are necessitated because, in the shooting of scenes, story points were missed. 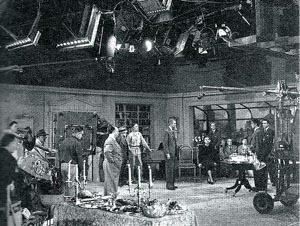 The extra expository shots are generally identified by an audience for what they are – artificial devices to cover what had been overlooked in the preparation of the film. How can this be avoided? I think it can best be avoided if a shooting script is edited before the shooting starts. In this way, nothing extra is shot and, most important, story points will be made naturally within the action itself. If we do not edit before we shoot, we may be faced in the cutting room with one of the most difficult of editorial problems – the unexplained lapse of time. The passage of time may be essential to the plot but it may not have been made clear in the sequences that have been shot. There was a time – long since passed – when one would simply have photographed the words ‘one week later’ in transparency and caused them to appear on the screen in mid-air during the second scene. The lapse of time can easily be indicated by the simple method of shooting one scene as a day scene and the next as a night scene – or one scene with leaves on the trees and the next one with snow on the ground. These are obvious examples but they serve to point to the need for script editing before production commences. A director tries never to go on the floor without a complete shooting script but, for one reason or another, one often has to start with what is really an incomplete script. The most glaring omission in the conventional script, I believe, is camera movement. The director may decide on the floor how he is going to film a sequence – but I maintain that the time for such a decision is in the preparation of the script. Here we encounter once again the fact that the tendency today is to shoot scenes and sequences and not to shoot pictures. The angle from which a scene is to be shot ought to flow logically from the preceding shot and it ought to be so designed that it will fit smoothly into whatever follows it. Actually, if all the shooting is planned and incorporated into the script, one will never think about shooting a scene but merely about shooting a picture of which the scene in question is a part. The object of these remarks is to emphasize that I favour shooting pictures in sequence. The film is seen in sequence by an audience and the nearer a director gets to an audience’s point of view, the more easily he will be able to satisfy the audience. The satisfaction of an audience has been deprecated as an aim of picture making and I think that is a very grave mistake. There has been a tendency to sneer at audiences, to regard them as a tasteless mass to whose ignorance phenomenal concessions must be made by producers and directors. Why is this? One reason is that a director hears comments about his work constantly and these comments come, for the most part, from people associated with the industry. 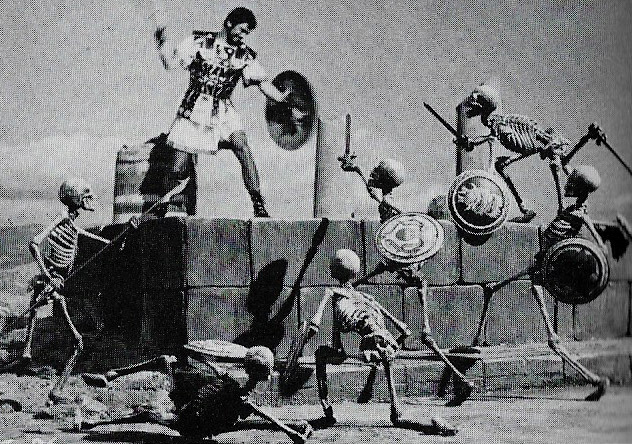 It is laudable to seek the applause and approbation of one’s co-workers but, once one begins making pictures for their satisfaction, it is only a short step to condemning lay audiences for their lack of appreciation of cinema craft. This is a dangerous point of view. Of course, it is a fine thing to make a picture whose technique excites admiration from people who indeed understand technique – but these are not the people who pay the costs of production! A picture-maker need not try to please everyone. It is important to decide at what audience one is aiming and then to keep one’s eye on that target. 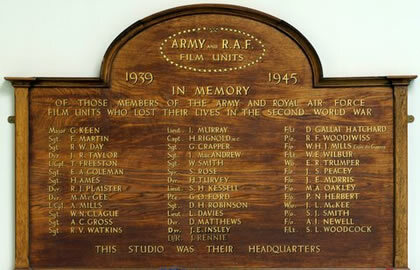 It is obviously uneconomic to shoot for a small audience and a motion picture costing some hundreds of thousands of pound, which has taken the efforts of perhaps one or two hundred men, cannot direct its appeal towards people with a special knowledge of film-making or to a certain section of the community. To approach a cinema audience with contempt invites contempt in response. The great playwrights, Barrie and Pinero for example, rendered more than lip service in their respect for their audiences. They wrote every line with a conciousness that it was designed to entertain adult human beings and every line they wrote shows it. By the reasoning of those who maintain that intelligent drama cannot obtain a mass audience, their plays should all have been artistic successes and financial failures – but we know that they were well received, that many of them were terrific hits and we should profit by that knowledge. I turn now to the actual techniques of picture-making. I have a liking, for instance, for a roving camera because I believe, as do many other directors, that a moving picture should really move. I have definite ideas about the use of cuts and fade-outs which, improperly handled, can remind the audience of the unreality of our medium and take them away from the plot – but those are personal prejudices of mine. I do not try to bend the plot to fit technique – I adapt technique to the plot. A particular camera angle may give a cameraman, or even a director, a particularly satisfying effect but, dramatically, is it the best way of telling whatever part of the story it is trying to tell? If not, it should not be used. The motion picture is not an arena for the display of techniques. An audience is never going to think ‘what magnificent work with the boom!’ or ‘that dolly is very nicely handled!’ The audience is mainly focussed on what the characters on the screen are doing – and it is a director’s job to keep the audience interested in that. Technique which attracts the audience’s attention is poor technique. The mark of a good technique is that it is unnoticed. 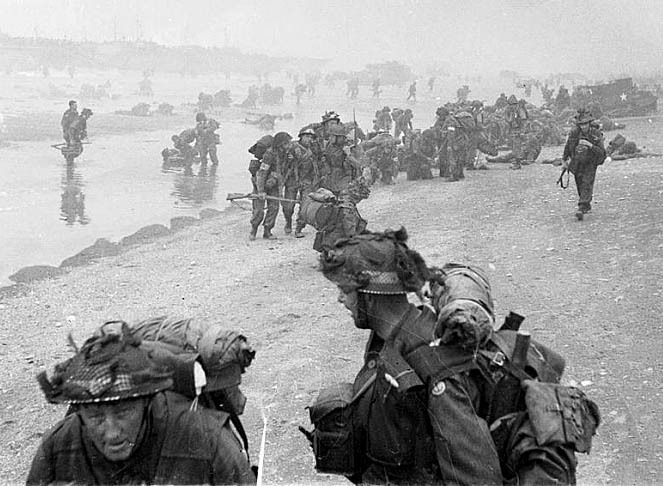 Even within a single picture techniques should vary, although the overall method of handling the story, the style, must remain constant. It is, for instance, obvious that audience concentration is higher at the beginning of a picture than at the end. The act of sitting in one place must eventually induce a certain lassitude. In order that this lassitude should not be translated into boredom or impatience, it is often necessary to accelerate the progress of the story towards the end – particularly of a long picture. This means more action and less dialogue or, if dialogue is essential, speeches ought to be short, a little louder and more forceful that they would be if the same scene were played earlier in the picture. It is sometimes necessary to encourage artistes to overact! Of course, it takes a certain amount of tact to induce a good actor to do so and this is another argument in favour of shooting pictures more or less in sequence because, once one has edged an actor into overacting it is, sadly enough, entirely impossible to edge him back again! Direction is, of course, a matter of decisions. The important thing is that the director should make his decisions when the need for them arises and operate with as few rules as possible. 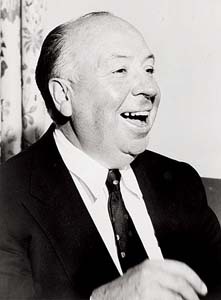 Alfred Hitchcock was born on 13 August 1899, in Leytonstone, London – the son of greengrocers William & Emma Hitchcock. 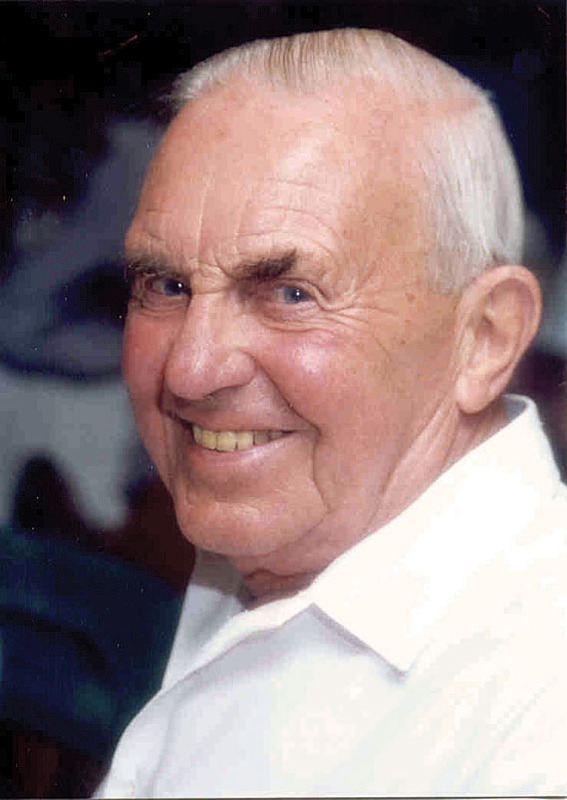 After graduating from the London County Council School of Engineering and Navigation, he became a draftsman and advertising designer with a cable company. During this period, he became intrigued by photography and started working in film production in 1921 in London as a title-card designer for the London branch of what would later become Paramount Pictures.